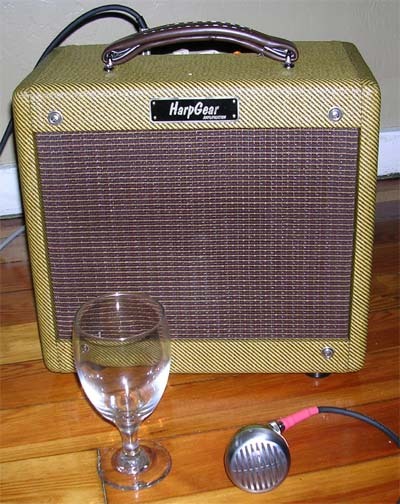 How to get better amplified tone. One thing I find with quite a few players I run into is that there tone can be improved when playing amplified. Some have been playing for a short time and some have been playing for a long time. If you have good acoustic tone you may be able to help your amplified tone with these simple tips. Before I go any further I want to thank Dennis Gruenling who spent the time with me to show me how to get good amplified tone. Everything on this page was shown to me by him including the glass exercise I will show you. The first thing that you will need to work on is mic grip. I will break this down into steps. Please note that there are plenty of other grips that work well for other people. I am just showing you the one I and many other players use with great success. 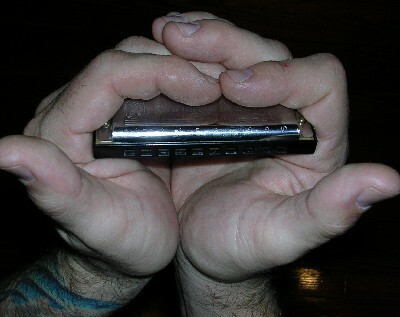 First how to hold the harmonica. 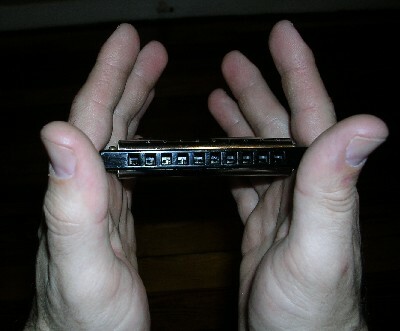 We will place the harmonica in our hands right above the crease where the pointer finger meets the hand. You will see the hands are evenly placed and the harp is held with pressure between the hands. Next we will bring our fingers over the top of the harp with the right fingers on top of the left fingers and bring the heels of our hands together. Please note I am leaving the playing surface uncovered so I can get deep placement of the harmonica in my mouth. 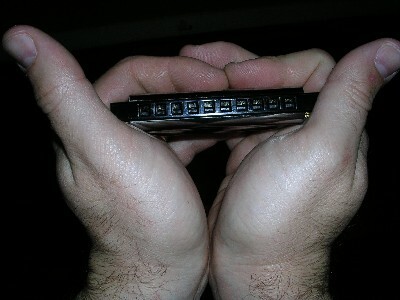 This is how we will hold the harmonica while holding the microphone. Now it is time to add the microphone. I get asked how deep do I hold the mic when it is in my hand. 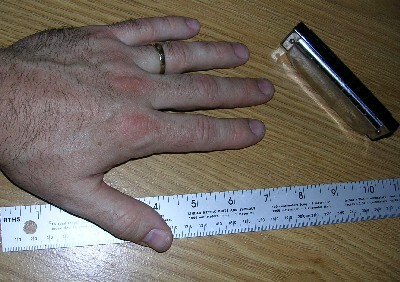 I place the mic in my hand so that it is held in place by my pinky and ring finger. I also took a picture of what it looks like when I am holding the mic and harp together. 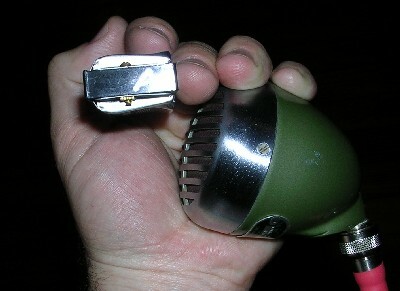 This cutaway shows the small space between the mic and harp which allows a "tone chamber" of sorts. It also gives you an idea of how the harp and mic interact with each other. 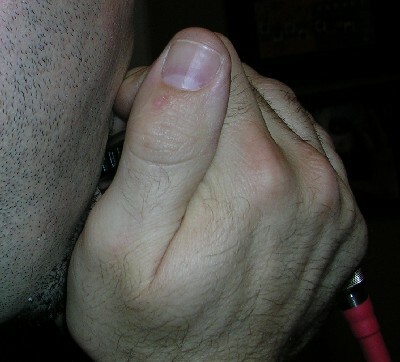 Now that you have the mic in your hands with harmonica it will look like this. The heels of your palms should be together and in full contact with the mic. No air should escape there. This will feel impossible at first but trust me, it is very possible and takes time and practice. The next step is to bring this to your face. 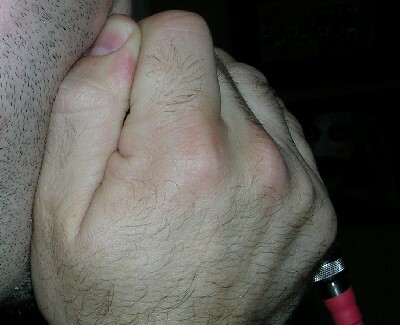 Your chin will fit into the open area under the harmonica . You will bring your left thumb up along the left side of your face. Then rock the harp and mic to the right side of your face so that your thumb is tight against the right side of your face as if you intend to play with the side of your mouth. The fingers on the top close off the top side of the harp making it airtight. 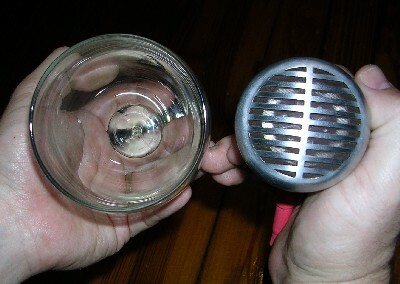 Done right you will have an airtight cup around the harp and mic. 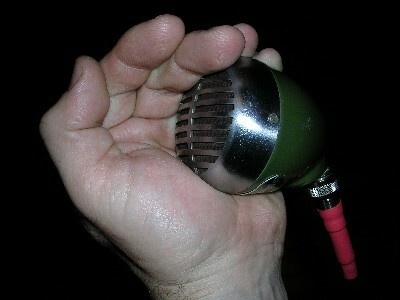 This will overdrive the mic element giving us the overdriven, fat, round and brown sound we all desire. Right side. Do you see any air pockets? The harp and mic are buried in there. No air will escape it. The heels of my hands closing the bottom off. The top is closed also. This is the key to great amplified tone. Now lets look at some common tone mistakes with the microphone / harp / face interface. You can see here that the right hand is not sealing the cup and there is too much room for air to escape. Here is another common mistake. The right hand is almost there but not quite. Just bring the thumb to the face and you will have it. Here is a video of me playing a lick with and without a tight cup amplified. I also hear, "I can't move the harp in my mouth with this tight cup." It is a matter of practice. 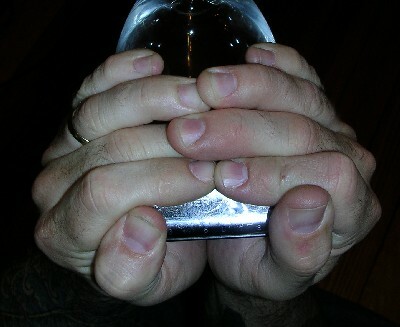 I find that the base of my index fingers push the harp from side to side while my face and mic stay put. 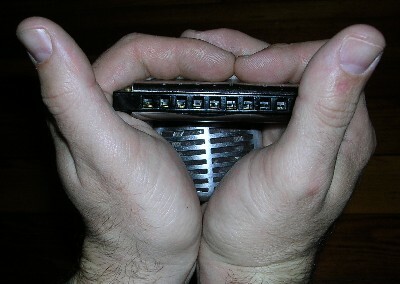 When playing the harmonica properly you will be moving the harp and not the face anyways . Unless of course you are doing a headshake or some other effect. So think of the harmonica like a typewriter bar and and let it ride in the pocket from side to side while everything else stays tight. The excercise below will help you become accustomed to moving the harp in the cup. People who see me hold the mic will commonly say, "You have big hands. Mine are too small to do that.". My hands are very average ( 8" from heel to middle finger tip exactly ) and it is about practice and working with the technique. I have an exercise that will make holding a bullet mic seem like child's play. ( Once again thanks Dennis G. ) Find yourself a nice coffee mug or wine glass with a big mouth like the one in the picture. This is a full sized 520SL green bullet and not a 707A bullet. The glass is just that big. Now we are going to hold it like a bullet and get a tight seal like with the bullet mic. If you are having problems with the mic this will seem ridiculous. It isn't trust me. This is the type of practice it takes to get this critical step right in amplified playing. Here it is with the harp and totally sealed. Now practice playing some songs, licks or whatever you like. Do this for one week for 10 minutes a day. The first day you will be leaking air and the inside of your forearms WILL burn. Keep it up and continuously try to get the seal perfect. Don't forget to roll it to the right and get a good seal on the right side as well. In this time I challenge you not to touch a bullet mic. After seven days of not touching the mic and doing this for 10 minutes everyday while you practice your stuff you will hold the mic like it's a babies toy. Your grip will be strong and consistant. Now I realize this is hard work. I did it and I still do it. I will routinely practice with a coffee cup and just play. I'll do it for 10-30 minutes at a time 3-4 days a week. Why? Because it is what it takes to get it right for me. I heard a story once and I will try to relay it here effectively. One day there was a man who had played violin for 25 years and was world renowned discussing with an interviewer how he gets disappointed about his playing. He said it drives him to practice 8 hrs a day to be as perfect as possible and yet he is still not satisfied. The intereviewer said, "I can't believe you could be dissatisfied with your playing! You sound excellent. I would give my life to sound like you!". The violin player just looked at him and said, "I did give my whole life to play like this." This new HarpGear 2 I used for the video and article will be going to Greg M. in CA. Please enjoy it.